Get Over the Winter Blahs! This week I am going to focus on ridding myself of my winter blahs. And as I am doing so hopefully I will be able to inspire you to get out of any funk you may find yourselves in! I love gardening. 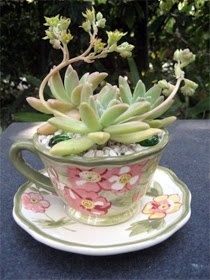 And one of the funner and easiest gardening you can possibly do it succulents! Super easy to grow indoors, as well as out. You can put them into just about any container. If it has a hole…. it will work. I will be using my Great Grandma’s teacups for planting. The pictures are not mine. But I will be updating later when mine are all finished. So simple yet so stunning. First start with a container, in my case it is a tea cup. If there is no hole in the bottom for drainage, you will have to drill a hole. Then put a small layer of pebbles down for drainage. Fill the rest up with soil, make a small hole for the succulent. Place the succulent in and push it into place. 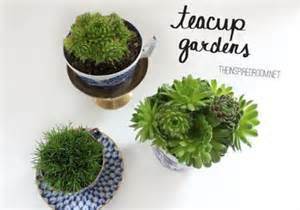 You can have one succulent, or fill it tight with them. 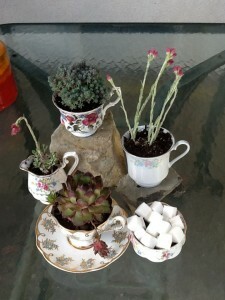 I like the look of both so I will be having a few done up with a variety of succulents. Give it a nice watering and there you go! !